A contemplative portrait of Ron 'Stray Dog' Hall: biker, Vietnam Vet, and lover of small dogs. A woman tries to eek out a living working low-wage jobs in America. A feature adaptation of Barbara Ehrenreich's 2001 book Nickel And Dimed: On (Not) Getting By In America. 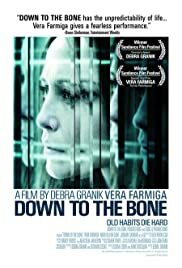 'Down to the Bone' is a mirror depiction of the lower-to-middle class struggle to keep clean while trying to overcome the perils of poverty and raise a family. It is not your typical run-of-the-mill addiction story either, revealing the darker sides of the problem and focusing on the lives it so often can tear apart. Vera Farmiga was the shining star in this role as Irene, a mother of two trying to keep her cocaine addiction a secret and save a marriage on the rocks. At 'Sundance' Vera took home 'The Special Jury Prize' for her performance and Director Debra Granik won the 'Director's Award.' It's no wonder that Martin Scorsese went out of his way to get her for her upcoming role in "The Departed." She is and will be a great actress in Hollywood for years to come. I look forward to her success in the future.